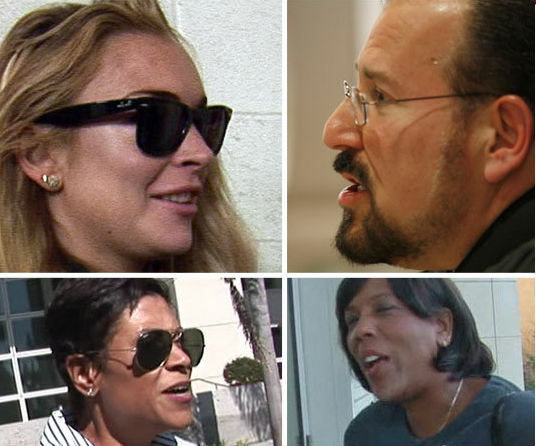 The judge who will determine Lindsay Lohan's fate in the probation and grand theft cases will be the middleman in plea negotiations today between Lindsay and the prosecutor ... and sources connected with the case tell TMZ ... the judge thinks Lindsay should do time. Lindsay will appear today before Judge Keith L. Schwartz, and sources connected with the case tell TMZ that during the hearing prosecutor Danette Meyers will present Lindsay's lawyer, Shawn Holley, with a formal offer to plea bargain the case. Sources tell us Meyers has already told Holley any deal will include significant jail time ... but Lindsay steadfastly refuses to accept a plea that involves time behind bars. Sources connected with the case tell us Judge Schwartz will propose that Lindsay accept jail time for the probation violation and three years felony probation for the grand theft case. But here's the BIG problem with that -- if Lindsay gets in trouble during the probationary period, she'll go to state prison.